One of my first big moments helping my mom in the kitchen was when we were living in Brussels, Belgium. I was about 12 or 13, and she and my dad had invited some of her friends from work over for a dinner party. She puts on the most scrumptious dinner parties! Well she had decided to make butternut squash ravioli, among a myriad of other delicacies. However, she was trying to rush rolling out the pasta dough, and it kept tearing apart on her, so she asked me to come help. The lesson we both learned that day: you can’t rush pasta dough. You have to be tender with it, let it take its time. Word to the wise: making homemade ravioli, start-to-finish-with-sauce-from-scratch, is not for the easily dissuaded, the faint of heart, or the “I have to have dinner on in 30 minutes or my family might EXPLODE!” You could certainly prep the veggies and filling the day before. You could probably even make and freeze the ravioli, though I’ve never tried it. That would certainly make it go much faster. I knew we would be having a “European Dinner” when I decided I would make this on my way home from work yesterday. Ben made an alternative dinner for Milo to eat at 6:30; Ben and I didn’t sit down to eat until 8:30… I suppose if I hadn’t stopped to take pictures or kiss ow-ies or lick the spatula (once I was done using it of course), it probably could have been ready by 8. That’s when you just say “Opa!” and enjoy a glorious meal at 8:30 instead of 6:30. Someday I hope you make this. If you have a friend to help you, all the better. I feel a little like Laverne & Shirley on an assembly line putting together these adorable, not-so-little ravioli, except Ben doesn’t want to be my Laverne, so I just play both parts. I forgot that the pasta dough is supposed to rest in the fridge for an hour before you roll it out, so that didn’t happen. I think it turned out fine, but if you want to make the dough first like you’re supposed to, you’ll need to skip ahead and come back, ’cause I documented this in the order that it happened in my kitchen. First, I julienned my veggies for the butter walnut sauce. Julienned is this fancy-pants term that means to cut your food into thin strips, like matchsticks. So technically, thin fries are really julienned potatoes. Look at how fancy that just got! Put on some bling next time you eat fries. 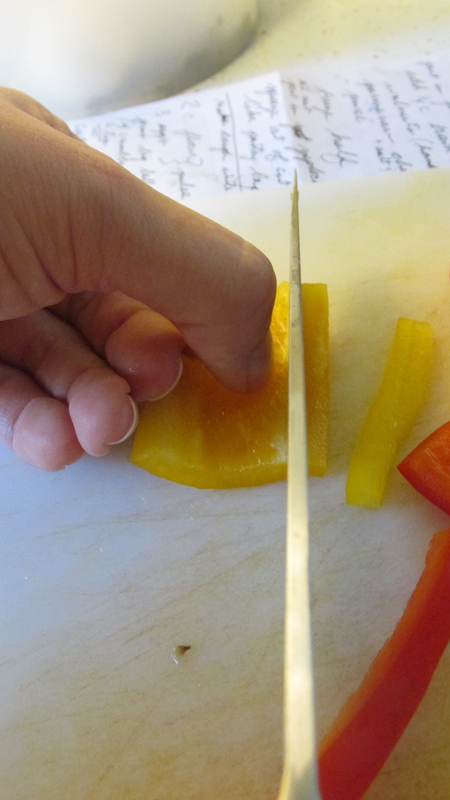 Begin by cutting the carrot: slice the carrot lengthwise, then place the carrot cut side down. Cut into thirds, the slice each third lengthwise into thin strips. I cut the very edges off and eat them, because they’re a little too thin. Plus, raw carrots are so good for your eyes. Double plus, your forewarning included that this recipe will take some time and perseverance. We’re gonna need the sustenance for the long haul! 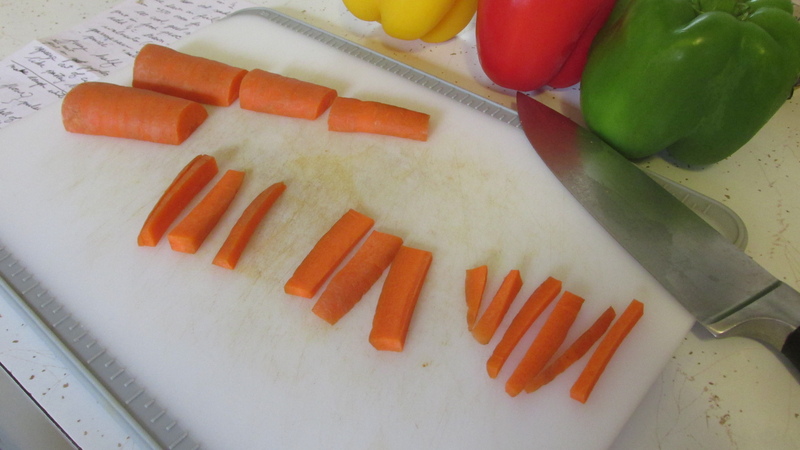 After you’ve cut the carrot portion into slices, lay those slices flat, and slice those slices in half (read that photo left to right and you’ll see the progression.) Keep thinking “matchsticks” as your guide, though these will only be matchstick in comparison to the whole vegetable. (I don’t really want to tediously cut all my veggies to true matchstick proportions, do you?) And before you know it, you’ve just julienned! Look at you go!!! 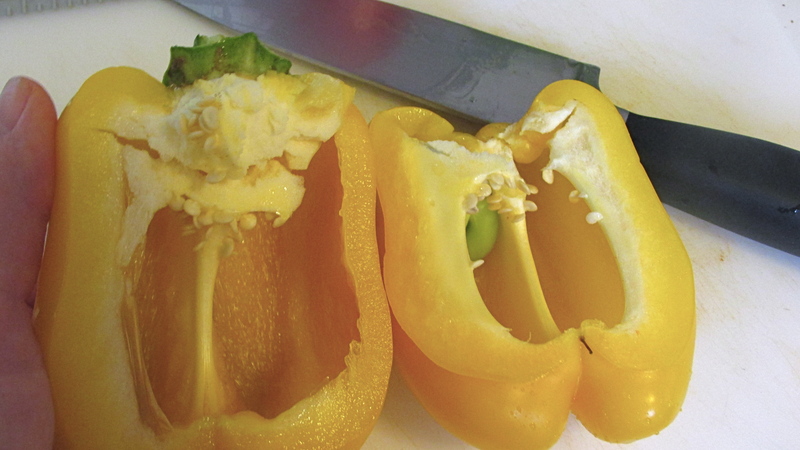 Go Pro Tip: the easiest way to de-stem and de-vein a bell pepper is to cut in half, starting at the middle. Now pretend that you’re visiting Brussels and eating mussels. 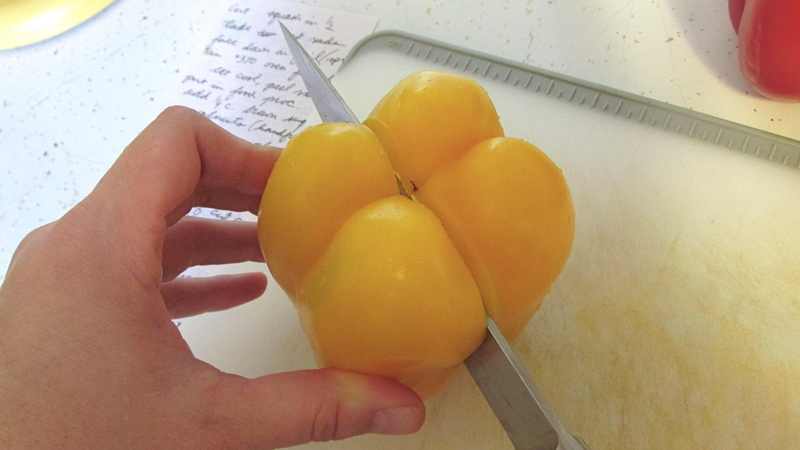 Pull that pepper apart like it’s a shell, with the stem as a hinge. Go ahead and completely separate the two halves. You may need to help the stem pull apart from one of the halves. Lay one half down, and holding the other half, use your free hand to simply pull out the veins and rip out the stem. I forgot to mentions that you don’t have to wash your peppers before you start, because it’s easiest to simply rinse out the seeds, and you can wash the outside at this time too. Now cut off the rounded top, just below where it starts to curve. Cut what’s left of the halves into quarters. 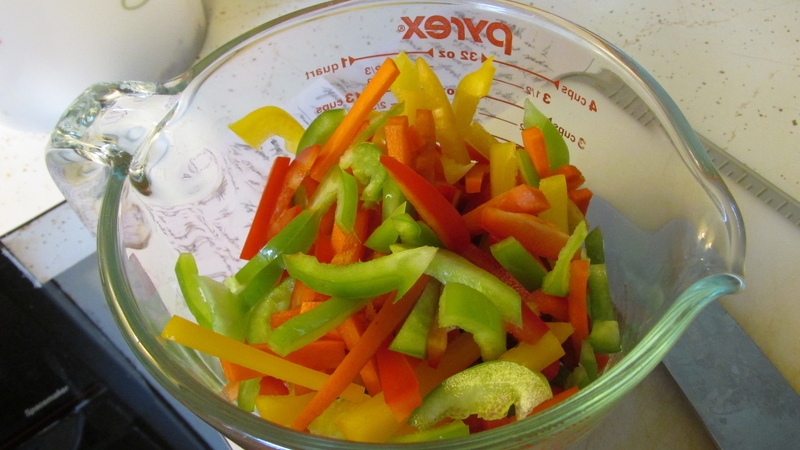 Time to julienne that pepper! 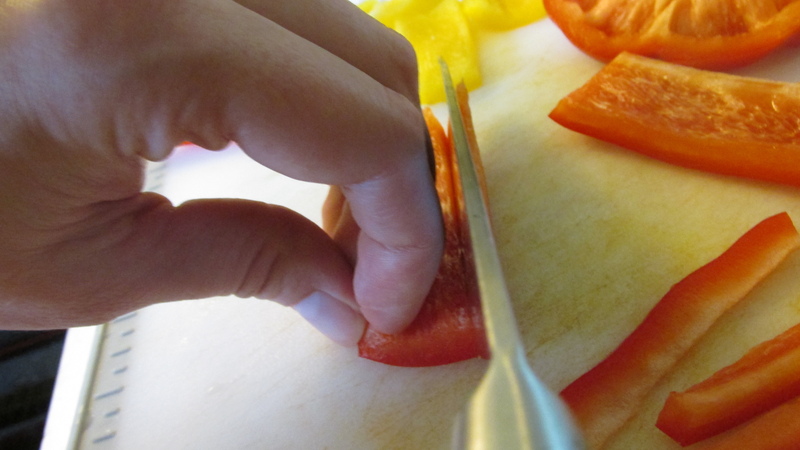 Go Pro Tip: when cutting, chopping, dicing, etc, the safest way is to use your knuckles as a guide. A good knife is a sharp knife, and dull knives are actually move dangerous than sharp knives. But obviously, the risk with sharp knives is that if it can cut through peppers and steaks and chicken cartilage (barf), it can cut through your finger too. If you skin your knuckle, by golly, it’s going to hurt. A lot! But you’ll still have your knuckle, and the rest of your finger too. (I haven’t done it, but a friend of mine lost the very edge of her fingertip cutting lobster – case in point.) So, here’s what knuckle-cutting looks like (not actually cutting your knuckle, this ain’t no horror blog). This isn’t really necessary for larger items where you’re stabilizing the object and slicing and dicing is a few inches from your fingers. Once you start getting closer though, time to go claw-handed and pop out those knuckles. (I feel a hip-hop beat would be appropriate here.) 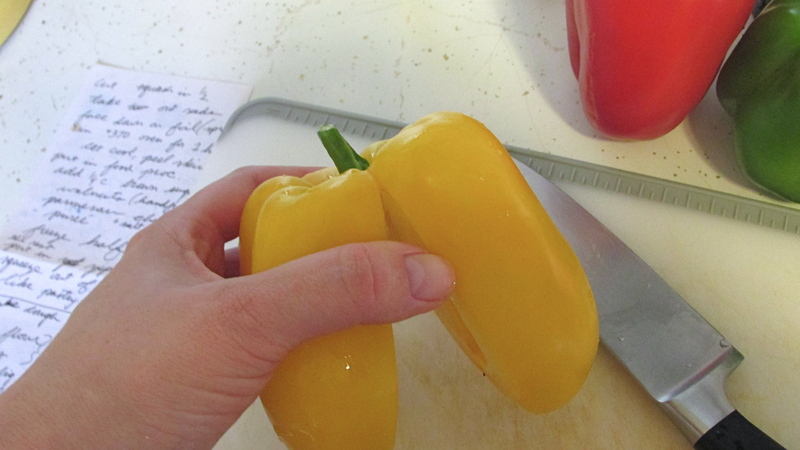 If it’s a really small object, you can also use your thumb knuckle, as demonstrated on the yellow pepper. I tend to go pretty slow once I’m cutting close to my fingers. For all my Go Pro Tips, I still get nervous about pain and blood, and I don’t do this all day every day, soooo…. take you’re time, folks, that’s A-Okay! Once you’ve sliced the pepper quarters, halve those slices, and then slice up the curved top that we had lopped off earlier. 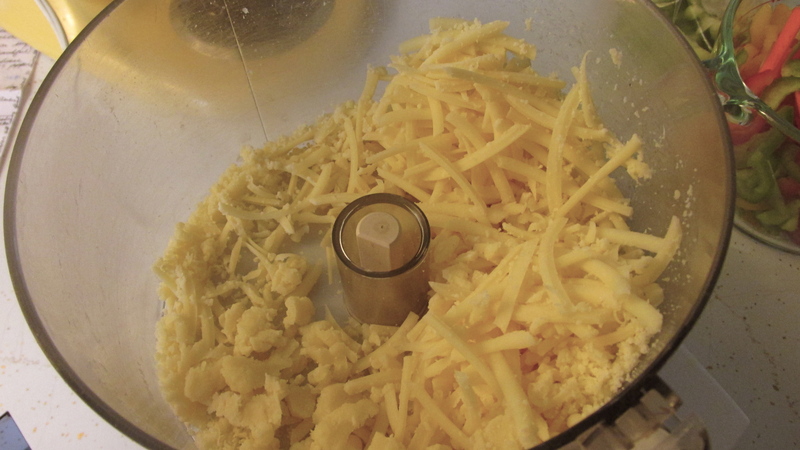 Here’s why we don’t own a cheese grater, and I don’t even bother with my mandolin-grater when it comes to cheese (or anything else I want shredded, for that matter). In less than 30 seconds, we went from this (that’s the entire 8 ounces of my fancy-pants white cheddar, minus a slight chunk that Ben and I wanted to try first)…. To this! Shredded cheddar awesomeness! Now all you have to do is nestle in the blade (you don’t even have to take the cheese out, because you’ll be adding the rest of the filling ingredients to blend them all together). So here we have our shredded cheese, canned pumpkin, walnuts, spices, and brown sugar. Blend that all together until it’s relatively smooth. There’s no raw egg, so no raw risk; go ahead, take out a clean spoon, and taste a little. Put on your thinking cap and make sure it’s just right. I ended up adding a little more brown sugar and salt to mine. You might want more nutmeg, or maybe you think it needs a hint of ginger or cayenne? Go for it! Just remember, you can always add more spice, but taking out spice is not so easy. You either have to add more of all the other ingredients in order to compensate for over-spicing, or start all over (which would be horribly wasteful). So there’s your PSA about getting too shake-happy when adding more spice. Go Pro Tip 1: place your plastic bag in a large glass to hold it open (unless you do in fact have a Laverne helping you out). Go Pro Tip 2: When pouring ingredients from the bowl of your Cuisinart, use your ring finger (or pinkie or middle finger) to keep the blade from falling out, and the rest of your fingers and thumb to grip the bowl. Like so. I’m essentially using my ring finger and thumb like a clamp to pinch the bowl and keep the blade in place. Awesome-sauce! Now get the rest of the filling in that bag, start sealing it, but be sure to squeeze out any air at the top before you finish sealing. Resist all urges to ditch the ravioli completely; don’t eat all the filling straight from the bowl. Just don’t scrape it clean into the bag, and instead, enjoy the little bits leftover. Maybe give the spatula to someone you love, and let them taste-test it too. On to the pasta! Get a large pot of water on the stove, add a ton of salt (I’ve heard time and time again on cooking shows that you want your pasta water to be like the ocean – extra salty), put a lid on it, and turn the heat on to medium-high. It will probably start boiling before you’re done making the ravioli. Just turn it down to medium-low and keep it hot while you finish these little beauties, but that way it’s ready when you are. 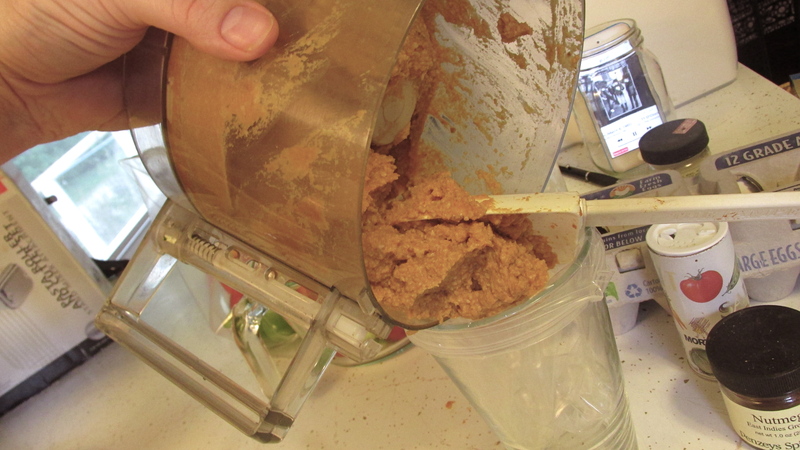 Back to your rinsed and dried Cuisinart, I use half whole wheat flour and half all-purpose flour (APF), but you can certainly use only APF… it just won’t be as whole-grain-wholesome for you. On top of that, add 3 eggs. 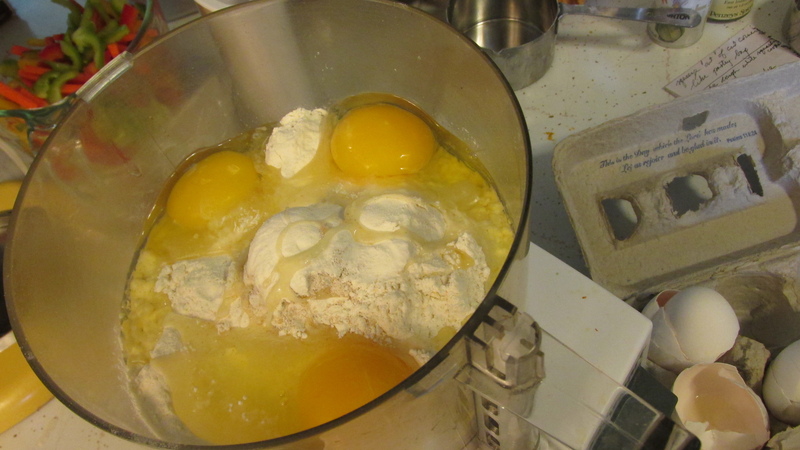 (Did you use the egg trick at the bottom of my Scones to Start recipe? Good job!) Pulse until it forms a crumbly looking dough ball. 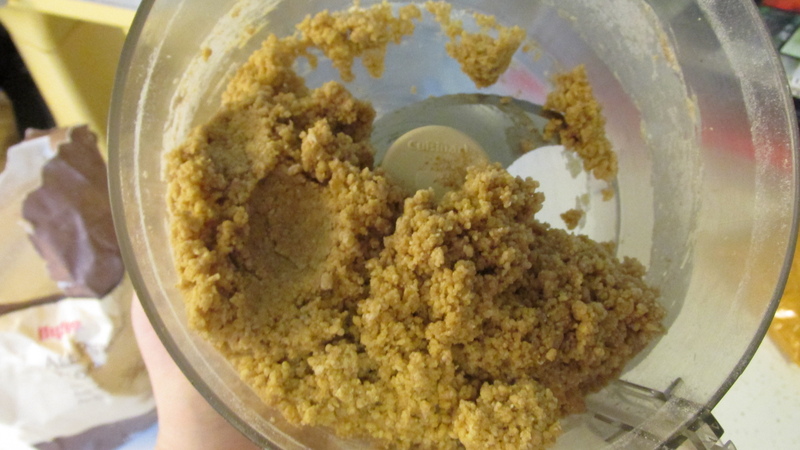 If it looks too dry as you’re pulsing it, add water, 1 tsp at a time until it gets to an ever so barely stickiness. 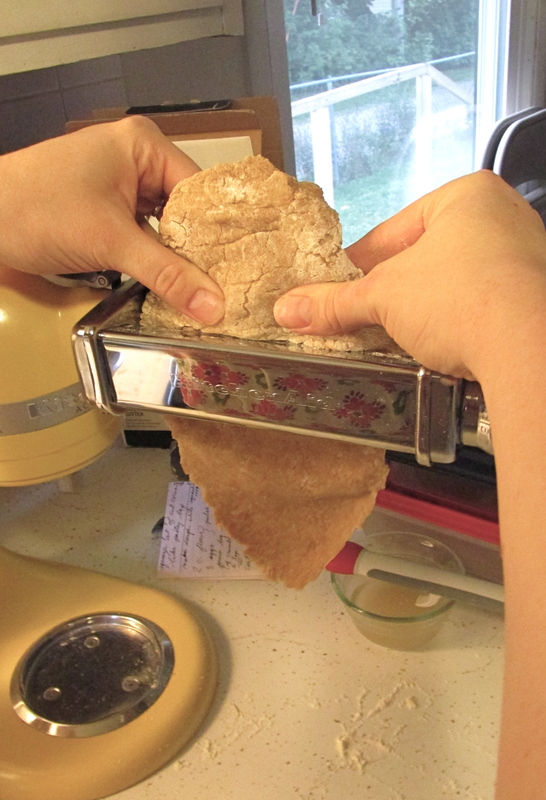 Carefully pull the dough out from around the blade onto a floured surface, and knead it a little until it’s not sticky. Separate it into two segments; wrap one segment in plastic wrap and put it into the fridge until you’re ready for it. Make sure your pasta maker is set to level 1, and turn on your KitchenAid to the lowest speed setting. 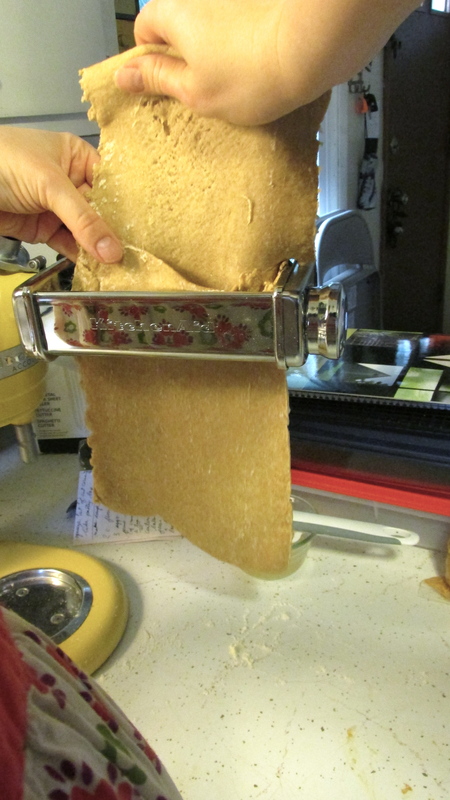 Carefully feed the dough into the pasta maker. It will come out looking stretched and torn and rather troubled at first, but just as beautiful as a woman’s stretch-marked belly after childbirth. That’s okay, just keep pushing that dough until it’s all the way through (more like the birthing part of childbirth?). Then fold it in half, and push it through again. Looks a little better this time, yeah? now fold that sheet of dough into half, but this time, folding down the top half and bringing up the bottom half so they ever so slightly overlap in the middle. This will give you smoother edges at the top and bottom. Lay the sheet down on a lightly floured counter, cutting into half or thirds as needed to fit on your counter. 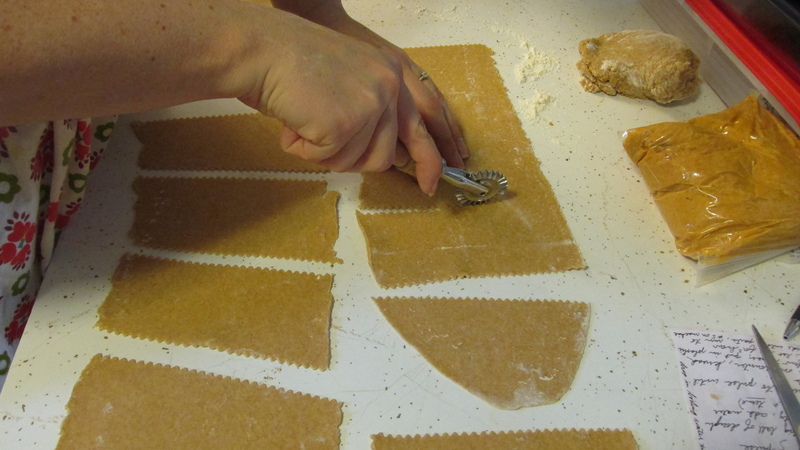 A rolling ravioli cutter certainly makes it easy and fun, but you can use a butter knife, too. 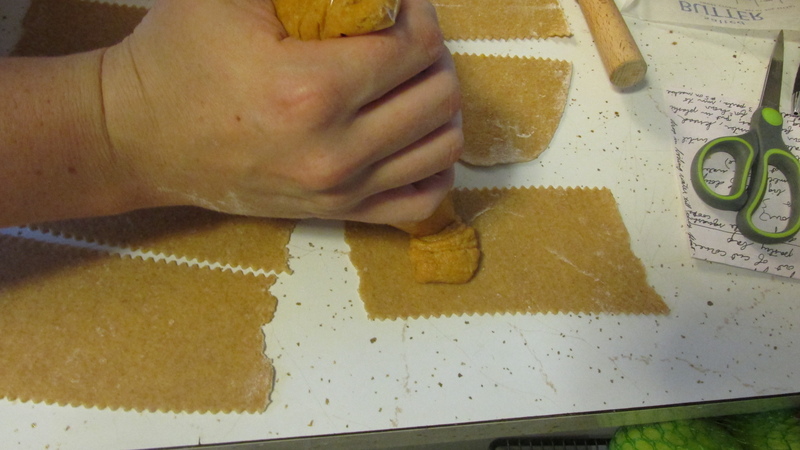 Cut the pasta sheets into strips that are about 2 – 2.5 inches wide. 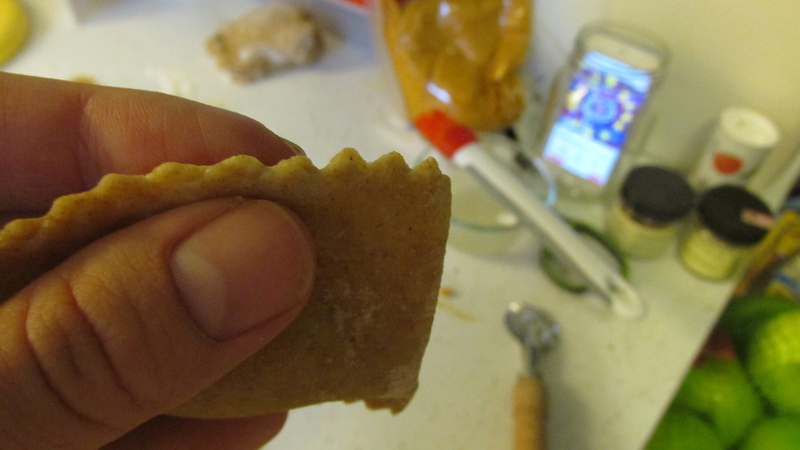 Now cut a corner off of your bag of glorious pumpkin filling, and squeeze the filling onto each strip. You’ll want to place a dollop just below the middle-line of the strip of dough, making sure not to put too much down, as you’ll need to pinch around the edges. If there’s too much filling, it will squeeze out while you’re closing the ravioli, and there won’t be a good seal. Then you’ll end up with empty noodle shells in paltry pumpkin broth instead of pumpkin ravioli. You could certainly still consume it, and we all know there are people in this world who would be so very grateful for such a meal, but it would definitely be yummier if the ravioli turn out. Get a small bowl of water and a pastry brush out, it’s finally time to see these ravioli come together! Dip the pastry brush into the water, you don’t need a lot of water, but enough to wipe along all four edges of the ravioli. This acts like a glue to help seal it shut. 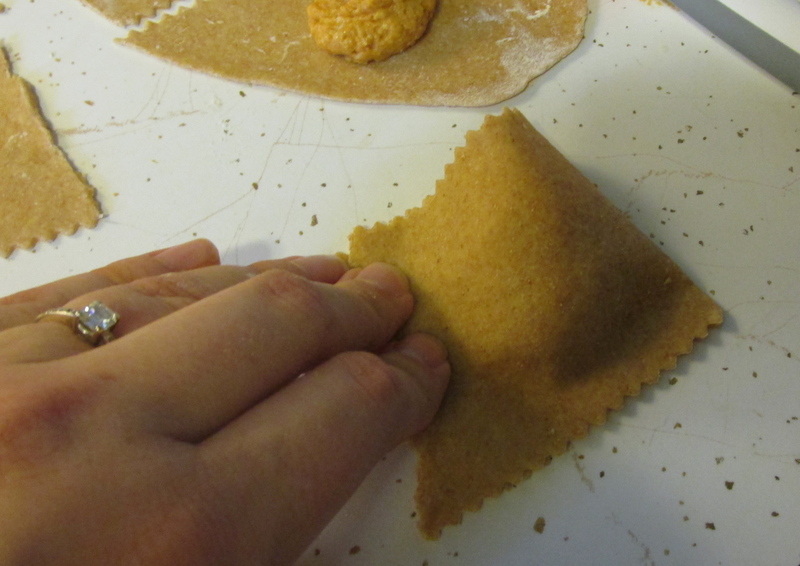 Fold down the top half over the bottom have, lining up the edges as best you can (a little trickier if the ravioli is more triangular than square, but still doable). Start pressing the two edges together at the fold, and work your way around to the other fold. I like to press both folds first and then work my way around, but that’s just personal preference. If you have too much filling and it starts to squish out, use your finger to wipe if off the edges and add a dab more water to seal. Now carefully pull the ravioli off the counter, and pinch around the edges one more time just for good measure. Once you’ve done a few, you’ll start to get the hang of it. 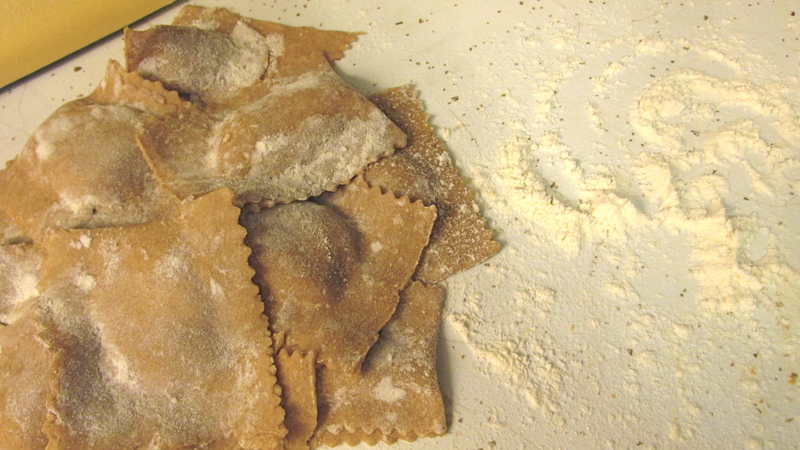 As you complete each ravioli, dust it with flour and put it on a plate. If you don’t dust them, they’ll stick to each other, and you’ll have more of a ravioli loaf than individual little pasta-pumpkin-pockets, and I’m quite sure that won’t turn out. Once you’ve completed this set, cover the plate with plastic wrap, pop it in the fridge, and get out the remaining dough that was previously put aside. Now is a good time to check on your once boiling water and get the butter sauce going. If you had turned down the boiling water, turn it back up again so it’s bubbling and boiling. Add more water so your stockpot is about 2/3 full. Meanwhile, get a large skillet out and add your two sticks of butter, along with the walnuts. 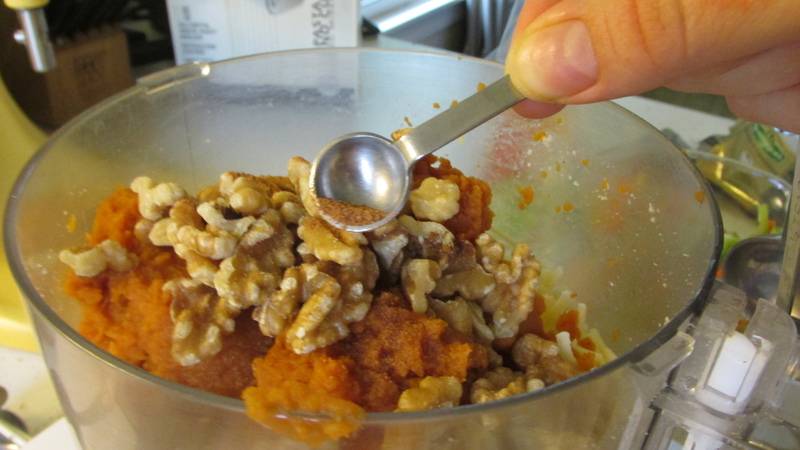 Turn the heat on to medium or medium low and let the walnuts toast a little and the butter start to bubble. Once the butter is fully melted, throw in those gorgeous vegetables you cut up, like, an hour ago, and let them start to sauté. Stir occasionally as needed. Obviously this requires a bit of multi-tasking as you keep your eye on the walnut/butter/veggie sauce and start rolling out ravioli. I have faith in you. Having completed one set of ravioli, you should be feeling like a pasta/ravioli making machine. You’ll whip those babies out in no time! This time, though, you can simply pile them up on the counter, preferably/hopefully near your stovetop and stockpot of boiling water. Once they’re all pressed and sealed and dusted and pile, pull the plate of ravioli from the fridge. Get a slotted spoon out, and a clean platter or large serving dish for the cooked ravioli. Starting with the counter-ravioli, drop them into the boiling water one by one, until they’re all in the pot (if they don’t all fit, you can do them in two batches). After about 5-10 minutes (depending on how thin you rolled your pasta) they will float to the top and be done. I like to fish one out and carefully punch off a corner of pasta (you don’t want hot pumpkin filling to jump out and burn you) to test and make sure. As they finish cooking, use your slotted spoon to get them out as they’re done. Did you remember to stir your butter sauce? Nice work! Once all your ravioli are on the platter, pour the sauce over them. Are you hungry yet? Call everyone to the table; it’s time to eat! 1. 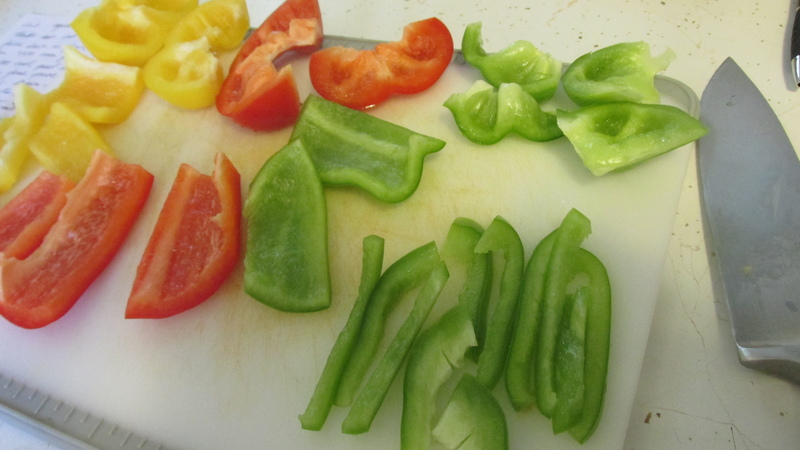 Wash and cut veggies into thin strips, set aside. 2. 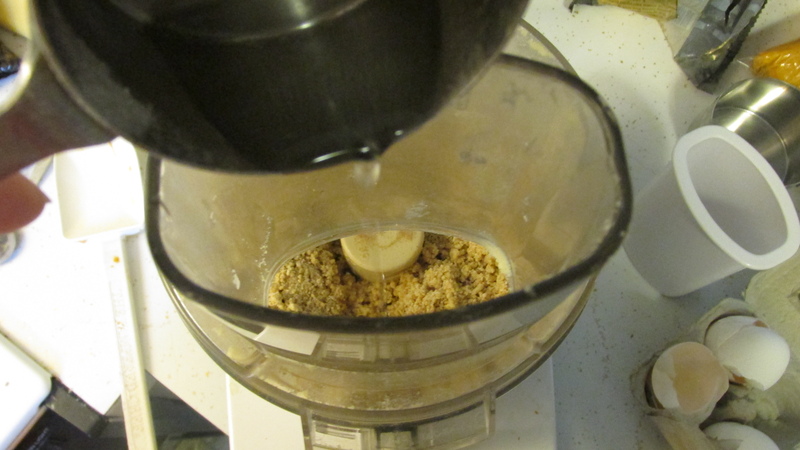 Blend filling ingredients together in a food processor until well mixed. Pour into plastic, sealable bag and set aside. 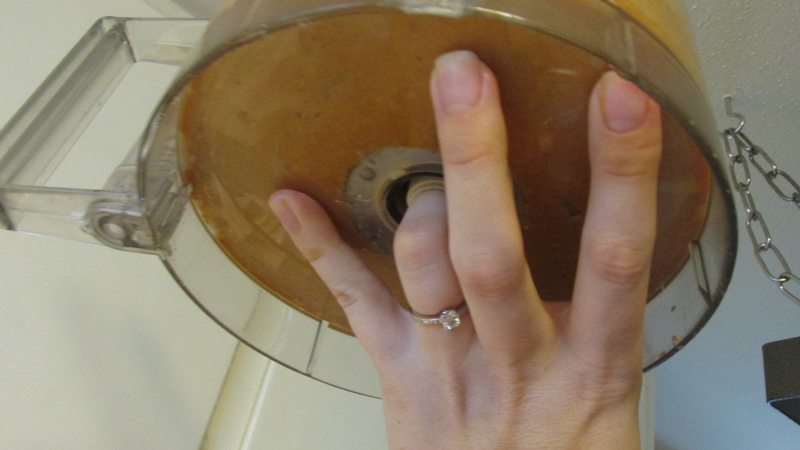 Rinse out food processor. 3. 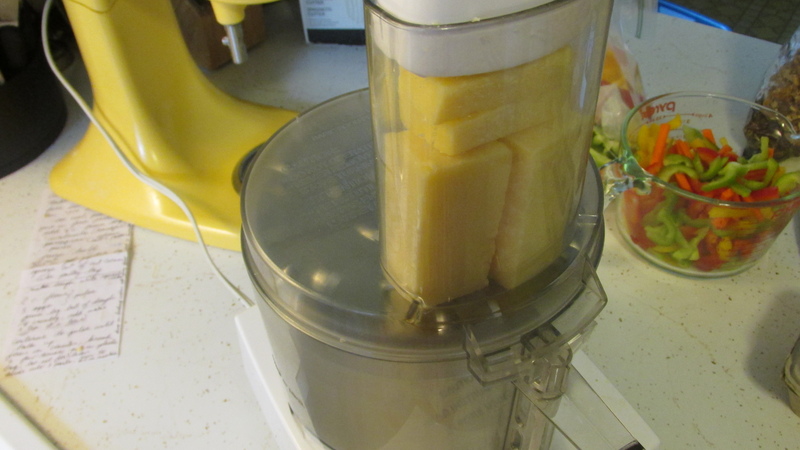 Blend pasta ingredients in food processor until it forms a ball; add water 1 tsp at a time if it’s too dry. 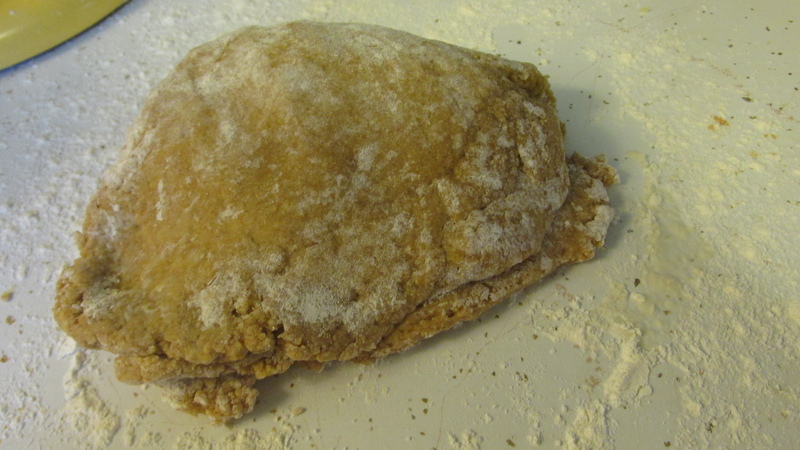 Pour pasta dough onto floured surface; knead a few times until no longer sticky. Separate into two segments, wrap one segment in plastic wrap and store in fridge. 4. Fill a stock-pot 2/3 full with salted water; place on stove over medium heat to bring to low boil. Place butter and walnuts in a sauté pan on stove with heat turned off. 5. Roll dough through pasta maker, on the lowest speed, starting at level 1. Fold sheet in half and re-roll at level 1, one to two times. Roll pasta sheet though level 2 one to two times. Repeat up through level 5. 6. 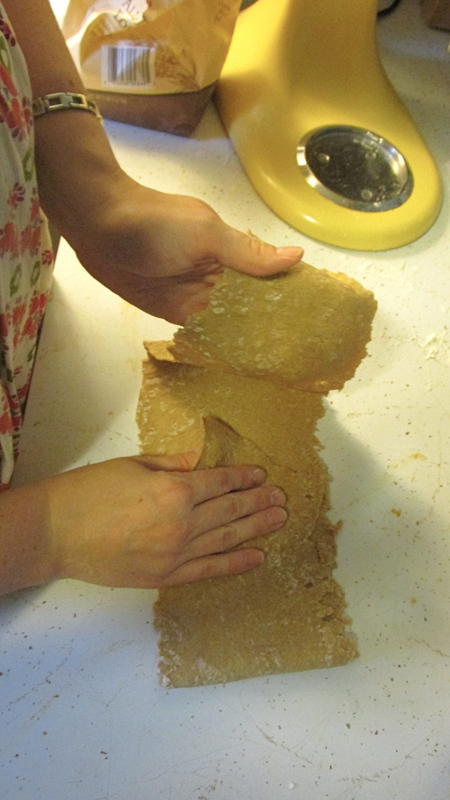 Place pasta sheet on floured counter, cut into 2 1/2 inch strips with pasta cutter. Use scissors to cut a corner off of filling bag. 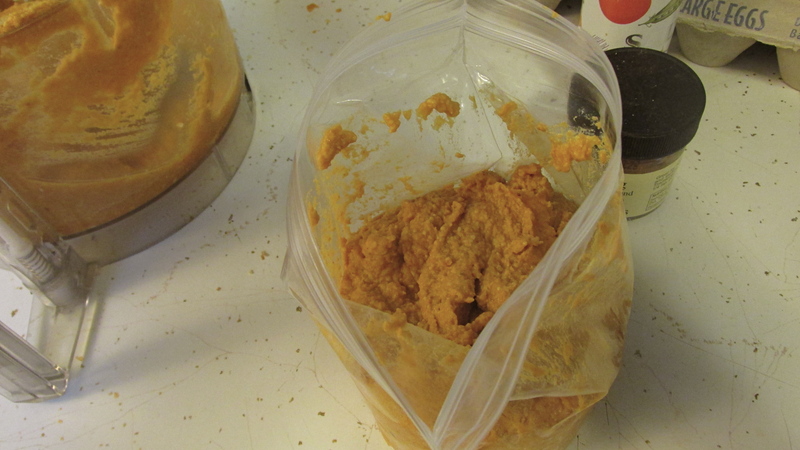 Squeeze pumpkin filling onto ravioli strips just below middle line, being careful not to overfill. 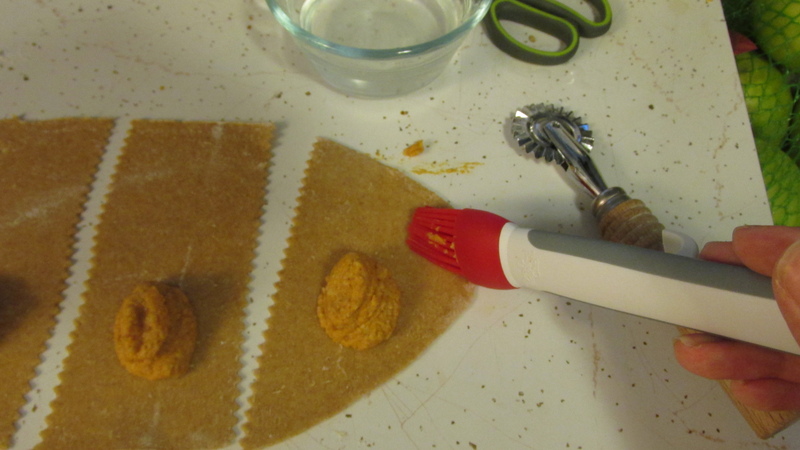 Dip a pastry brush in water and wipe along edges of ravioli strips. 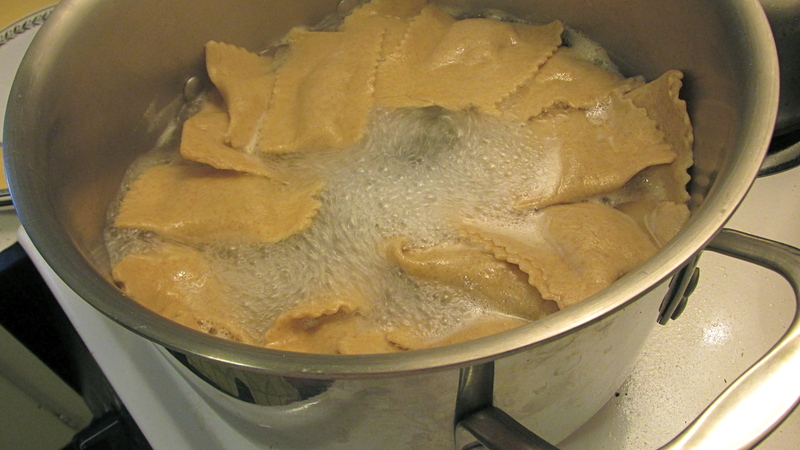 Pinch edges of ravioli together to seal, making sure no filling squeezes out – thus weakening the seal. 7. Dust finished ravioli with flour and put on a plate. Once all ravioli from first segment of pasta dough are completed, cover with plastic wrap and store in fridge. 8. Turn on burner under sauté pan to medium-low. 9. 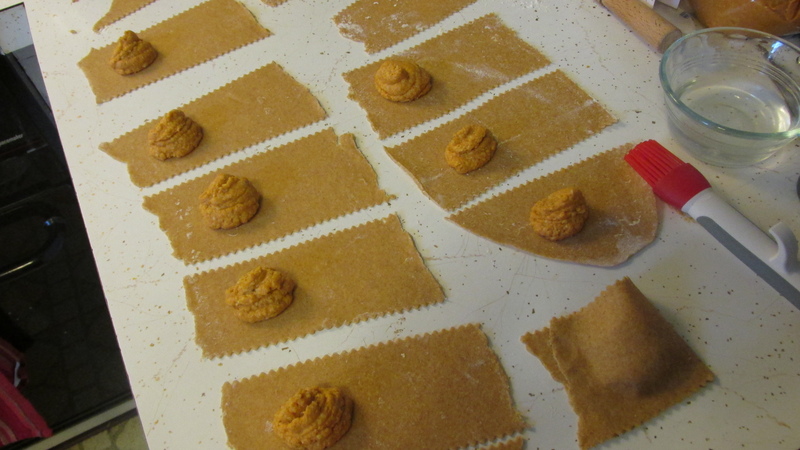 Pull out remaining pasta dough and repeat process, starting with step 5, piling completed ravioli on counter top. 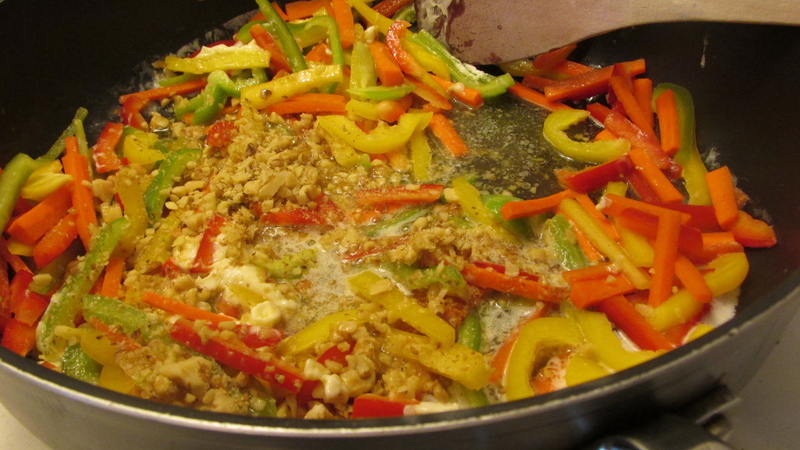 Keep an eye on butter-walnut sauce; add veggies and stir, increase heat to medium. 10. Pull out plate of first set of completed ravioli. 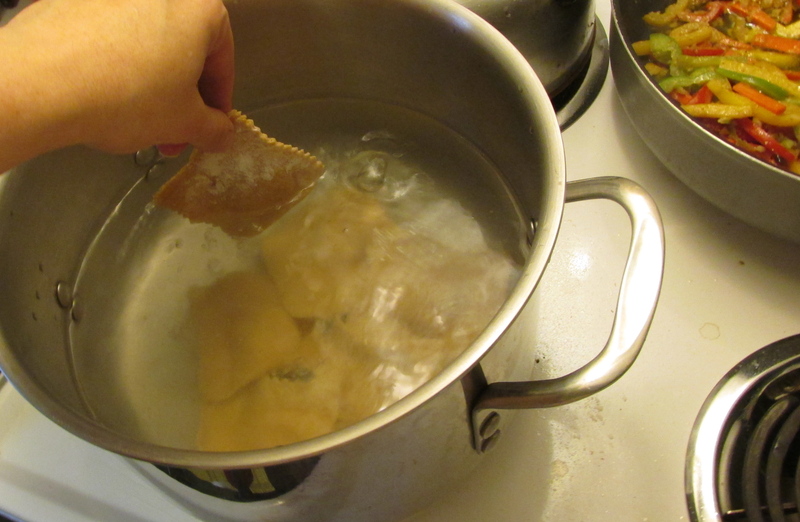 Starting with counter-ravioli, drop into boiling water one at a time until all ravioli are in the stockpot. Ravioli will float to the top when they are almost done, about 5-10 minutes. Stir butter-walnut-veggie sauce. 11. Use a slotted spoon to remove cooked ravioli and place on large serving dish. 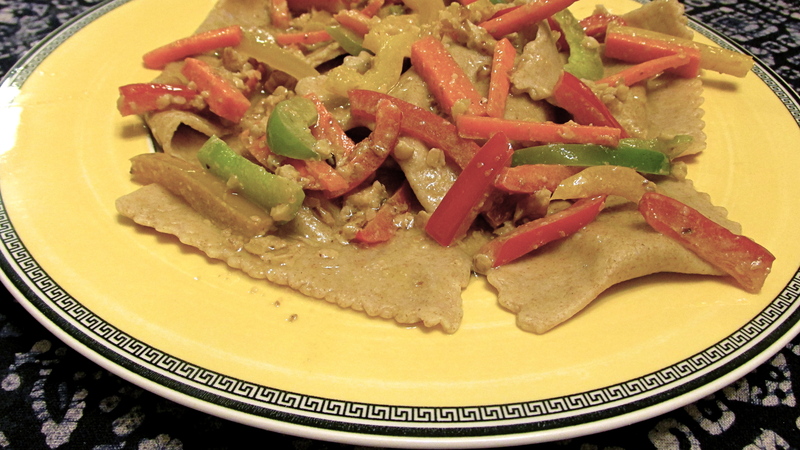 Pour butter-walnut sauce and sautéed veggies over ravioli. Serve and enjoy! Posted in how to..., Main Dish, Pasta, Vegetarian and tagged bell peppers, butter walnut sauce, carrots, julienne, pasta, pumpkin, shredded cheese, white cheddar. Bookmark the permalink.